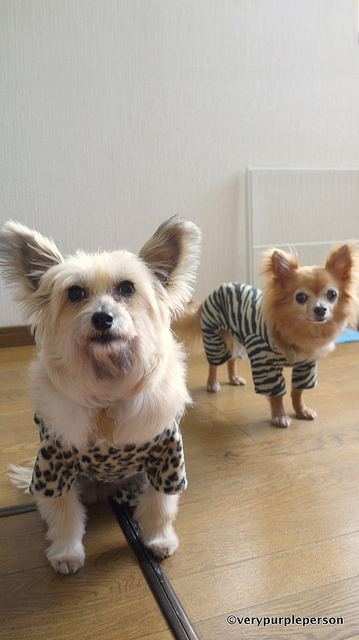 Winter is not the most enjoyable time for a 7 years old Chinese Crested and 14 years old Chihuahua, I made them these onesies so they can do their daily activities comfortably. When I say daily activities, it means sleeping all day on their heated dog bed. The pattern is Dog coverall by MillaMilla, size M for Fuwawa and size S for Okowa. 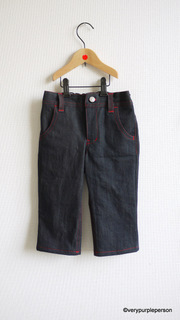 The onesies have open tummy and backside elastic around the tummy so they will stay in place. The pattern actually has waist seam so different fabric can be used to make it looks like separate top and pants. I omitted the seam and joined the pattern to make simple onesies. I made a muslin first for Fuwawa’s onesie using old T-shirt and it turned out that the bodice had to be shortened a bit. 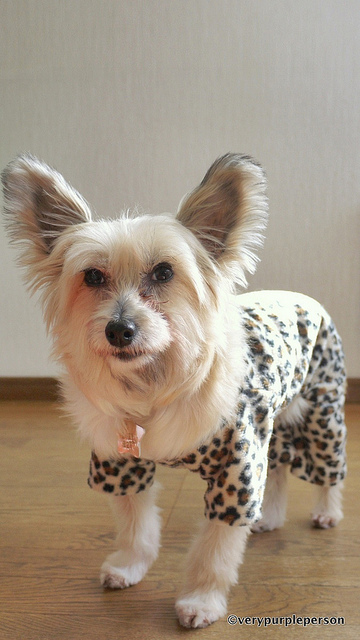 This version is made with stretch flannel in leopard print. 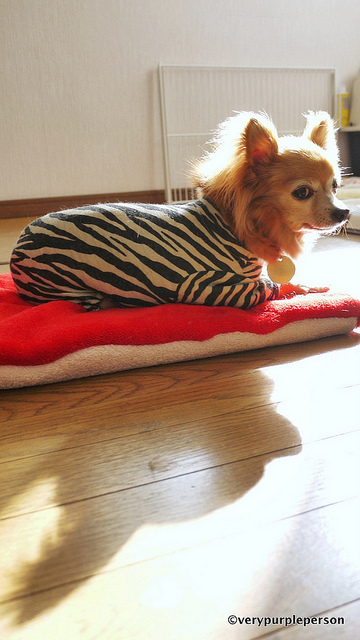 Okowa’s onesie is made with leftover zebra print jersey from my dress. The fit is okay except that I had to shorten the legs a bit and tighten the elastic. The zebra print is also a bit thin so I plan to make another one for Okowa. I would consider this one a muslin. 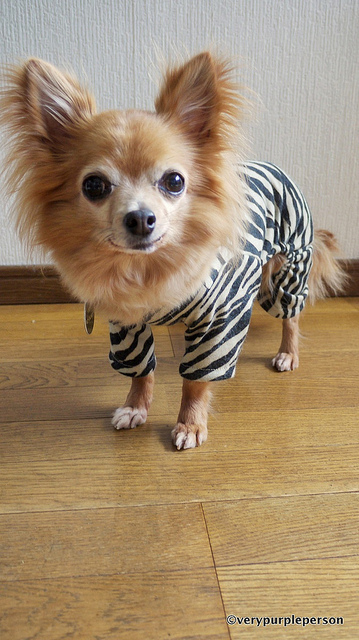 They don’t seem to thrilled about wearing the onesies though, but I guess no dogs ever get excited about clothes anyway. The good thing is they don’t shiver anymore in the morning when we just got out of the bedroom. 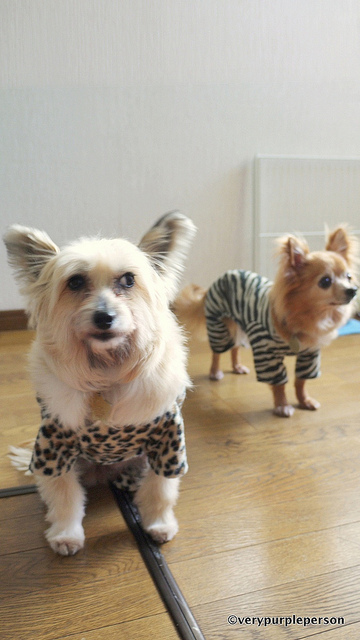 The onesies also amused a lot of people who saw them in their daily walk so that must be another good thing, right? 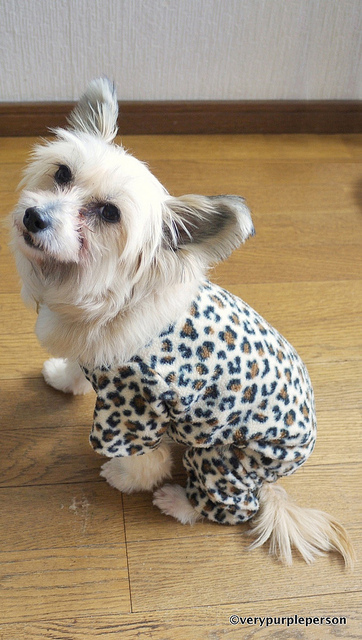 Pattern is Dog coverall by Millamilla (PDF) size S and M.